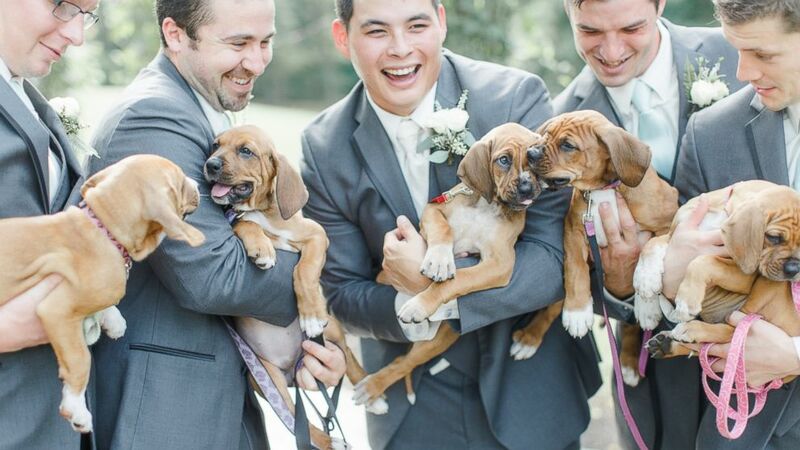 "The wedding party was loving all the puppy snuggles," their photographer said. What’s one way to make a wedding day even more magical? Puppies! 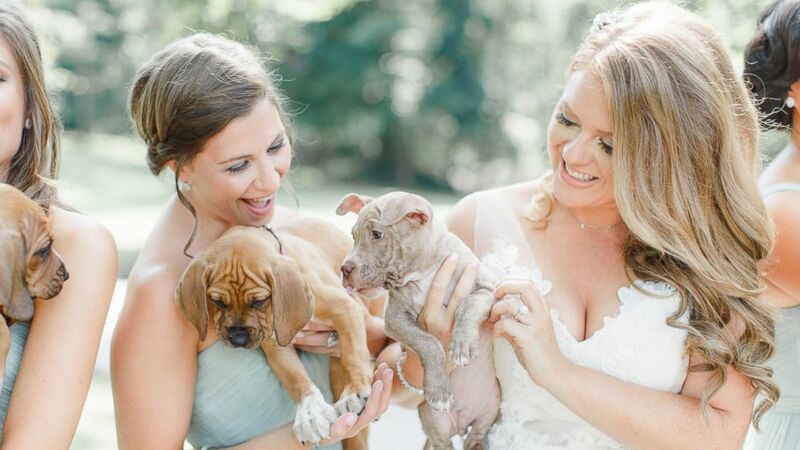 Matt Crain and Sarah Mallouk Crain included rescue puppies to break the ice on their big day. "Having the puppies involved in the wedding brought so much additional joy to Matt and Sarah's day," the couple’s wedding photographer, Caroline Logan, told ABC News. "The puppies, of course, caused the photos to be extra natural, candid, and carefree -- exactly what I strive for in my work! The wedding party was loving all the puppy snuggles." (Caroline Logan Photography ) Puppies add a paw-dorable touch to Pennsylvania couple's magical wedding. Sarah works at the nonprofit, Pitties Love Peace, focused on the rescue and rehabilitation of pit bulls. "Sarah has been with the organization from its inception, so it was only fitting to highlight this extra piece of her heart on her wedding day," said Logan. "Together, Sarah and her new husband, Matt, have a huge passion for rescue dogs. They currently have three dogs of their own, but are constantly fostering ones in need until they find their 'forever home.'" The Pennsylvania couple loves dogs so much that adding these four-legged friends into their September 10 nuptials seemed like the natural choice. "The bridal party loved it!," the photographer explained. 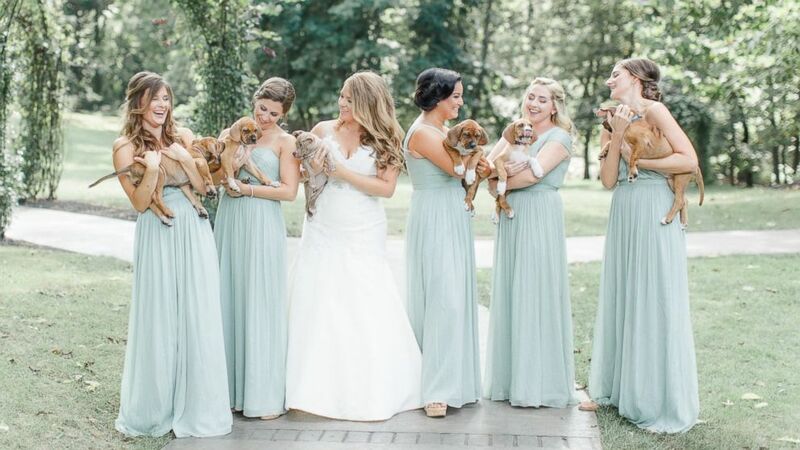 "From the minute the puppies came bounding around the corner exploring their new surroundings, the bridesmaids were gushing about how cute they were. It was a dream for everyone!" The litter of Boxer-Coonhound puppies highlighted in the photos are all sisters, named after the original five First Ladies of the United States: Martha, Abigail, Dolley, Elizabeth and Louisa. Logan said the pit bull the bride is holding "is a nine week old rescue pup from the streets of Brooklyn, lovingly referred to as 'Biggie Smalls.'" And they certainly made for paw-dorable photos for the newlyweds, who are traveling home from their honeymoon in Mexico today.